Sometimes, life throws at us things that over the years become too big to comprehend. Such are natural disasters, pandemic diseases, nuclear explosions, and wars. 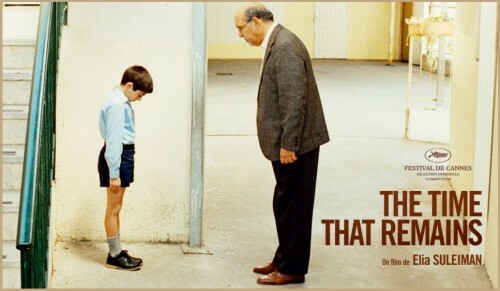 In his movie, released in 2009, Elia Suleiman sets on a journey to explore the genre of black comedy, so as to reveal to us the secret of coping with a tragedy of which the magnitude is overwhelming. It is the nature of human mind to always look for some form of normality, maybe a little static, but nevertheless, a feeling that your bases are covered, your life has a purpose and your entire existence in a certain place and at a certain time is not meaningless. This is what we, humans, do when gun battles, tanks and security surges are suddenly a persistent part of the daily routine. And this is exactly the focus of The Time That Remains. Half a century of tragedy is squeezed into an hour and a half of a laconic and precisely targeted shock therapy. Despite its smoothness and an accurately placed hint of suspense, this movie doesn’t truly give you a moment of rest. There’s no wallowing in self-pity here, no destructive mind blowing imagery; even the garden of executions is so well carved into the texture of the surrounding neighborhood that it appears natural despite your mind telling you that what you are looking at is a yelling contradiction to what is humanly acceptable. There’s also no conflict, in a traditional sense of the word, around which the story would evolve. All there is is a deceptively distanced and only seemingly uninvolved bitterly comic narration about generations of painful struggle to remain human in a filled with nonsense reality, where even a direct participant finds himself merely an observer, trying to just be. The movie strikes as grotesque, largely satirical, very reflective and detailed. This effect doesn’t wear off till the very last scene. When telling the truth becomes a taboo, the sensationalism of this movie is found in the peculiar way of drawing attention to what should not be discussed, because the subject makes us uncomfortable. Elia Suleiman resorts to various means offered by cinematography in order to break the unbreakable, to jump over the wall. There are no loud graphic scenes in this movie, nothing at all that an adult cannot handle; yet, it is heavily loaded with incredible emotions that run deep in the film’s canvas, leaving you gulp for air at times. When deciding whether or not to watch this movie, don’t hesitate. Just watch. And prepare lots of tissues, even if you are known for having a thick skin.